Whether your credit card gets declined or you realize the restaurant you walked into only accepts cash, even the most well-prepared traveler can run into issues where they need cash — quickly! This is a feeling that is all too common for those who have traveled abroad, and since it’s not a fee that you have to pay for on the regular, many banking consumers accept it without much of a fight. This might change after you realize how expensive it is to withdraw money from a foreign ATM. Compare the foreign ATM fee and foreign transaction fees at the top banks in America. The foreign ATM fee and the foreign transaction fee. You are in for a big surprise if you mistakenly believe that there is only a flat fee involved with foreign ATM transactions. It is the norm for most banks to charge between one to three percent of a total transaction. These costs are reflective of withdrawals at out-of-network foreign ATMs for local currency. It is not necessarily the cost of transfers and inquiries performed at the ATMs, which may be less than the fee posted above, or it could also be free. For example, at Chase Bank, the cost of a withdrawal at a foreign ATM is $5 per transaction, while any transfers or inquiries will cost $2.50. Keep in mind that in addition to the fees that your banks may charge, you may also have to pay for any fee charged by the foreign ATM operator when you withdraw cash. 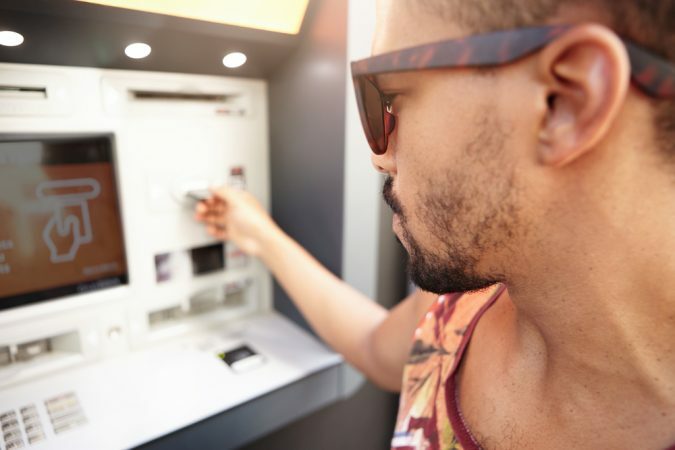 According to a banking analysis by MyBankTracker, the average fee for withdrawing money from a foreign ATM at the ten biggest banks in America was $4 — that’s 30 cents more from last year’s average of $3.70. Currently, the highest foreign withdrawal fee is $5. On the other hand, Capital One is only charging customers $2 — which is the lowest fee charged by a bank for this type of transaction. At Citibank, U.S. Bank, Capital One and TD Bank, the cost of withdrawing money at an out-of-network ATM can cost just as much as a foreign ATM withdrawal. In general, banks charge about double for foreign ATM transactions versus out-of-network ATMs. Just as you are charged a fee for exchanging money when traveling internationally, the same thing is applied to transactions at foreign ATMs. At the top 10 banks in America, the foreign transaction fee is three percent — except at TD Bank. In fact, TD Bank does not charge a foreign transaction fee on the total amount that is withdrawn. Let’s say you are a Bank of America checking customer, traveling to Italy on vacation, and need to withdraw some cash from an Italian ATM. BofA will charge you a flat rate of $5 just for simply using a foreign ATM, regardless of the amount you are trying to withdraw. On top of the $5 foreign ATM withdrawal fee, BofA also imposes an additional 3% foreign transaction fee. That means, if you need to withdraw, say, $60 in cash, BofA will also charge you an additional $1.80 (that’s 3% of $60). So, in total, BofA’s foreign fees added up to $6.80*. *This number assumes no other fees are being imposed by the operating foreign ATM — keep in mind, most foreign ATM’s will charge an additional fee of their own. You can expect to pay a flat fee of $3 for any out-of-network and foreign ATM transactions at TD Bank. Many people don’t realize the difference between the two and waive off the question as if it doesn’t matter. You might be making a costly mistake by doing this. Note that there can be a difference in the cost of the transaction depending on if the payment is processed in U.S. versus in foreign currency. For example, in addition to the foreign ATM fee of $2.50, U.S. Bank will charge two percent on the total amount of the transaction for payments processed in dollars, while a three percent charge will be applied for processing it in international currency. When you make transactions in a foreign currency, you need to think about the exchange rate. The exchange rate depends on many different factors, such as the type of transaction, dollar amount, type of currency, date and time, and whether the transaction is either a debit or credit. Also, the rate is constantly fluctuating. ATM fees have become the deciding factor for customers who are shopping around for a bank. The general consensus is that ATM fees should go away — along with the plethora of possible fees connected to a bank account. Banks know how important fees are — or the lack of them — in gaining customers. Although they’re not willing to provide free out-of-network and foreign ATMs to all of its customers, they have found a way to offer the service at no charge to some. If you travel abroad frequently, it would be useful to open an account with one of the biggest banks in America. Major U.S. banks usually have global branches all over the world that can get you access to these services without having to pay for them. These banks are more likely to partner with banks from other countries. You’ll be able to withdraw cash from other global banks and won’t be charged a fee. It’s important to know in advance where to find bank branches in the country and overseas. Signing up for a no-fee ATM card will give you the freedom to withdraw money without having to worry about racking up fees. Keep in mind that you don’t necessarily have to change banks to avoid ATM fees overseas, as many banks will waive them for certain checking account holders. The foreign transaction fee won’t be waived, however. To avoid fees altogether, you should consider getting a credit card that has no foreign transaction fee. When you convert your American dollars into foreign currency, the amount you’ll get depends on the exchange rate. Not everyone offers the same exchange rate and where you go really makes a difference on how much money you’ll receive. For example, if the euro exchange rate is 1 dollar to 0.80 euros and you can get the very best exchange rate, $100 will get you 80 euros. However, many ATMs and money exchange booths will only give you a poor exchange rate of 75, 70 or even fewer euros, after fees. That’s why it pays to find a good rate. To get the best exchange rate, you should use your American credit card whenever you can. Credit card companies work internationally and regularly exchange money so they give the best rate. Your next best option is to take money out of ATMs from large banks in foreign companies. ATMs that don’t belong to a major bank, like the ones found in hotels and convenient stores, usually give out a much worse exchange rate and have higher fees. Converting actual cash at money exchange counters also leads to a poor exchange rate, and the money counters at the airport are usually the worst. Make sure your bank and other financial institutions know that you will be traveling overseas. Even the slightest deviation from your normal spending pattern can raise a red flag for the fraud department, which may result in your account being frozen or your credit card denied. While you might be on vacation, it’s going to be business as usual with your credit cards and other bills back home. Make sure to double check when all your payments are due before you leave. It’d be a good idea to pay everything ahead of time because you might not have access to your bank account while you’re traveling. This way you can avoid costly missed payments. For example, just being a couple days late on your credit card payment could lead missed payment fee up to $35, a jacked up penalty interest rate on your account, and even a hit against your credit score if you wait too long to make the payment. It’s also a good idea to do some research beforehand to see if your bank has locations in the country you are traveling to. Don’t let foreign bank fees ruin your trip. By using this advice, you can avoid bank fees while traveling abroad. Does TD Bank Offer Free Coin Counting Machines? Are Your Bank’s Safe Deposit Boxes Safe? Theresa is a research analyst at MyBankTracker.com. She is an expert in bank fees and policies, money psychology and consumer spending.